Homeschool Legacy is a Christian company that uses God as the focus of their work. The unit studies are almost no prep and great for all homeschoolers. These are labled as Once-A-Week Unit Studies because most of the work in them can be done in one day. You use the rest of your week to expand on what you learn and maybe read books or such. 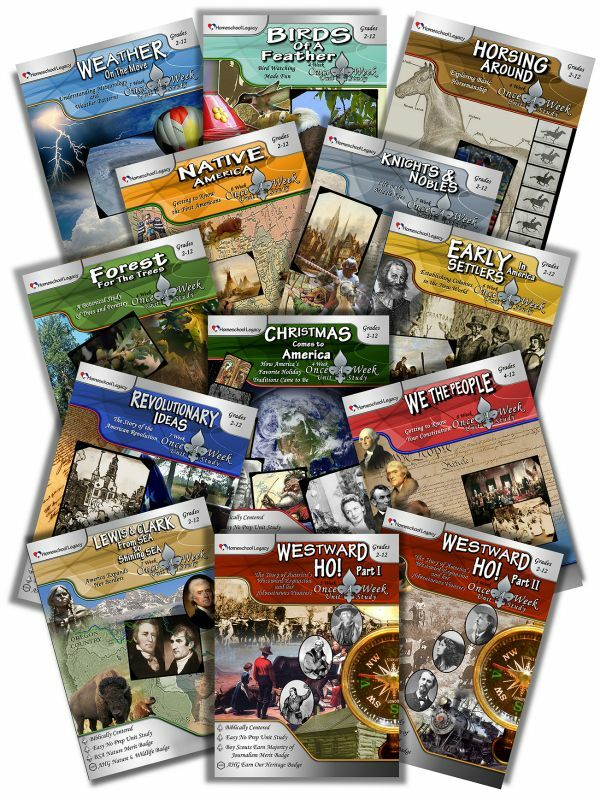 These also work really well with American Heritage Girls and Boy Scouts as the children can earn merit badges by completing these books. The unit study that we completed was Forest for the Trees. This unit study is labeled for 2nd to 12th graders. You can view a sample of the book. Forest for the Trees is a 4 week unit study, which is a great way to get up and get your family outside. There are family devotionals, field trips, trivia, art, and other awesome things in the lessons. A glance at how the week works. The week starts out with a list of books you will want to read for this weeks lessons. Next you get a list of supplies you will need for the week. Most of these things are things you already have around the house. You then get your daily activities followed by your weekly activity, which includes the devotional for the week. There is then some work that includes your vocabulary lessons as well as research lessons. Next there is an art lesson, then a physical activity, and then some type of science or field trip. The end of the week always gives you some "Dad Trivia", or mom trivia if there isn't a dad available. During the course of the weeks you will be making a nature journal as well. We had previously worked on a leaf book so this was a great way to expand on it and make a journal with lots more information as well as things besides just leaves. We are outside nature buffs here. We thrive on hands on learning and being able to enjoy weather when it is nice enough for us to get outside and go. We were a bit bummed by the last two weeks having so much rain but...mud doesn't always stop us, haha. We did some planting, which is always perfect for this time of year. We also made a yummy apple pie after we learned about apples. We learned so much about how things grow as well as how to start growing our own things. The kids have so many ideas on what we want to try to grow and how we will do it. The book had so much stuff to keep us going and keep the kids all interested. My "school" kids are ages 6-10 and I did not have any complaints from any of them. We will be doing more of the unit studies for sure. I hope my other christian homeschool families will give them a try as well. You can click below and see what my other crew members had to say about some of the other unit studies.